I had to check the headlines three times, but Venezuela’s new Supreme Court chief, Maikel José Moreno Pérez is a former policeman convicted of the 1987 murder of a woman, for which he served a year in prison (link in Spanish). Moreno, the new president of the court, served one year in prison after being granted a procedural benefit in 1990. After three months, he entered the Judicial Branch as a secretary of a court in Caracas despite having only studied one semester of law at Santa Maria University, where he graduated in 1995. Moreno was also investigated and found not guilty of a death following a shootout in 1989. Moreno was married in 2012 Miami to a Cuban-American woman nine years his senior. The marriage came under investigation for immigration fraud and ended in 2014. Additionally, El País reports that Moreno was alleged to have been a member of the legal system corruption group La banda de los enanos (The Dwarves’ Gang), an accusation denied by the legal system. As I have repeatedly posted over the years, migrants from other countries traveling through Mexico to reach the U.S. are frequently vulnerable to kidnapping. Two agents from a special police unit known as Fuerza Coahuila have been arrested for the alleged kidnapping and extortion of a family of Central American migrants who were trying to get to Texas. The police officers are accused of kidnapping and extorting the family by making promises of crossing them to Texas after a ransom was paid off. The agents had locked up the family at a stash house in this border city. Sources within the Coahuila Attorney General’s Office (PGJE) confirmed to Breitbart Texas that this week that members of the PGJE Investigative Police Unit carried out a raid at the stash house where the Fuerza Coahuila members had allegedly been holding the family. The operation was kicked off after a Central American woman contacted authorities about the kidnapping of her family, The PGJE investigators arrested the two Fuerza Coahuila officers at the stash house. Mexico’s government said on Friday it would not allow the United States to send undocumented migrants of other nationalities back to Mexico to await the outcome of their asylum proceedings in the US. Many of the undocumented migrants trying to make their way to the US are Central Americans fleeing poverty and violence in their homelands. After making a trek fraught with danger through Mexico, they often request asylum once they reach US soil. Mexico’s Foreign Secretary Luis Videgaray asserted last week that We’ll Go to the U.N. to Defend ‘Human Rights’ of Mexicans in U.S..
Peru’s President Talks Growth, Trade and ‘Bridges’ With TrumpU.S. President Donald Trump on Friday held his first sit-down meeting with a Latin American leader since taking office, and was told by visiting President Pedro Pablo Kuczynski of Peru that Peruvians “prefer bridges to walls. Mr. Kuczynski, a former Wall Street banker and ex-World Bank economist, came to discuss economic growth in the region and problematic hot spots such as Venezuela. Peru has a free-trade agreement with the U.S., China, Canada and European Union, among others. It was also a member of the Trans-Pacific Partnership, a trade pact from which Mr. Trump withdrew the U.S., and the Pacific Alliance, a four-member Latin American group that includes Mexico, Chile and Colombia. So 10 million Ecuadoreans will have a second go at the polls in a runoff April 2. Suddenly, the whiff of competitive democracy in this patch of the Andes, where so-called Bolivarian socialists once called the shots, has voters in a lather. They streamed by the thousands into Quito this week to stand vigil as the National Electoral Council inexplicably drip-fed its tally. Outside observers saw no foul play in the delay, but the anxiety was understandable. For the last decade, after all, this small and mostly poor Andean nation has lived in the shadow of Rafael Correa, a headstrong populist who ruled with one hand on the balcony and the other on the oil drum. Courting the poor, feeding the bureaucracy, bullying critics and hushing the media — all of these were part of the palace script. The Ecuadoran media watchdog Fundamedios documented 981 attacks on journalists over the last two years. (Correa’s response: Try to dissolve Fundamedios.) And if elections weren’t quite rigged, their rules were crafted to assure three-time President Correa and his ruling Alianza Pais coalition the upper hand. 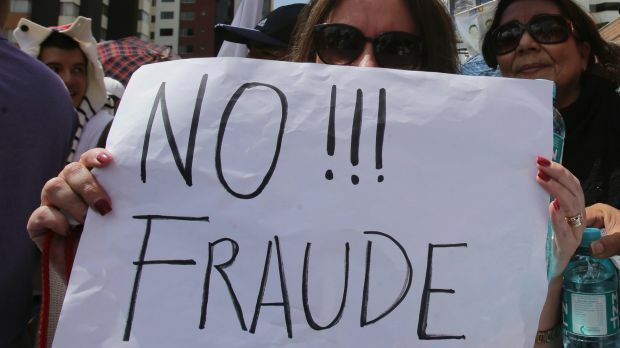 In fact, Correa’s errors were merely masked by plenty, including a windfall in oil revenues, which he splashed on social programs and the bottomless bureaucracy. His aura dimmed with the end of the commodities boom, when the slump in oil prices led the way into deep recession in 2016, with only modest growth projected for this year. If once Correa could thumb his nose at foreign creditors — he defaulted on $3.2 billion in sovereign bonds in 2008 — the downturn has forced his hand. Fitch Ratings reported that Ecuador needs some $10.3 billion this year to close its deficits. In five years, the country’s debt burden has swelled from 18 percent of gross domestic product to 40 percent today, Fitch said in a client note on Feb. 14. That’s a hole not even lavish Chinese loans can cover. I’m cautiously optimistic on the elections, in a “live to fight another day” way. The agency’s [Social Security Administration] inspector general found errors in the government’s documentation for representative payees, otherwise known as individuals who receive retirement or disability payments on behalf of another person who is incapable of managing the benefits themselves. The FBI’s field office in Miami estimates there are about 160 defendants on the lam from active Medicare fraud cases in South Florida. Together, the fugitives are accused of stealing hundreds of millions of dollars from the taxpayer-funded Medicare program for seniors and disabled by submitting false claims for a variety of bogus services, including medical supplies, physical therapy and prescription drugs. Almost all of the fugitives are Cuban-born immigrants who fled to Cuba, Mexico, the Dominican Republic and other Spanish-speaking countries to evade federal trials. With the exception of Cuba, several foreign countries with U.S. extradition treaties have assisted federal authorities in capturing and returning the Medicare fraud fugitives. But most of the time, the FBI simply catches a break when the fugitives try to come back to the United States. Hundreds of millions, indeed billions of your hard-earned dollars . . . gone.